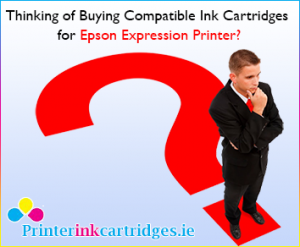 The Epson expression cartridges come in a standard and high capacity version. The high capacity version, also known as the XL, will produce more prints than the standard cartridge and is better value when bought as a compatible. Epson printer’s track record overall using compatible ink is very good with few printers rejecting the cartridges. From time to time the printers may display the message ‘cartridges cannot be recognised’. If this message appears when you first insert the ink cartridge then it’s likely that the cartridge is faulty, you can try removing and reinstalling, if this doesn’t work then replace the cartridge. If this message appears during printing then it’s likely that the ink is running low big advantage using compatible ink is that the cartridges are generally filled to capacity or has run out, check the ink levels (some printers will not display the ink volumes on compatible cartridges so this is also an indication that it’s time to replace the cartridge). Overall, the Epson Expression are a great All-in-One printer that works well alongside the compatible Epson ink cartridges.